Product Article Number 6ES7331-7KF02-0AB0 Product Description SIMAT.. Product Article Number 6ES7331-7NF00-0AB0 Product Description SIMAT.. Product Article Number 6ES7331-7NF10-0AB0 Product Description SIMAT..
Siemens SIMATIC S7-300, ANALOG INPUT SM 331, OPT. ISOL.,2/3/4 WIRE, 8AI, RESISTANCE, PT100/200/1000 .. 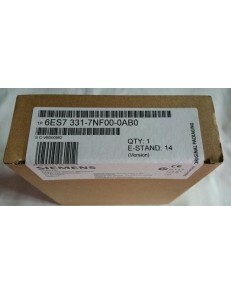 Product Article Number 6ES7331-7PF01-0AB0 Product Description SIMAT..
Siemens SIMATIC S7-300, ANALOG INPUT SM 331, OPTICALLY ISOLATATED, 8 AI THERMOCOUPLE, TYPE B, E, J, .. Product Article Number 6ES7331-7PF11-0AB0 Product Description SIMAT.. Product Article Number 6ES7331-7RD00-0AB0 Product Description SIMAT.. Product Article Number 6ES7331-7SF00-0AB0 Product Description SIMAT..
Siemens SIMATIC DP, HART ANALOG INPUT SM 331, 2 AI, 0/4 - 20MA HART, FOR ET200M WITH IM153-2, 1 X 20.. Product Article Number 6ES7331-7TF00-0AB0 Product Description SIMAT.. Product Article Number 6ES7332-5HB01-0AB0 Product Description SIMAT..
Siemens SIMATIC S7-300, ANALOG OUTPUT SM 332, OPTICALLY ISOLATED, FOR EXPANDED TEMPERATURE RANGE 2 A.. Product Article Number 6ES7332-5HD01-0AB0 Product Description SIMAT..